Reasons Why a Small Kitchen is Now an Advantage. The truth about a small kitchen is that it will not be the jack of all trades. You will have to give up the idea of doing homework here, paying bills here, and recipe searching in your small kitchen. The design goal for your small kitchen must be to achieve an effective small kitchen, not multipurpose space. There is nothing wrong with a kitchen that is just that, a kitchen. 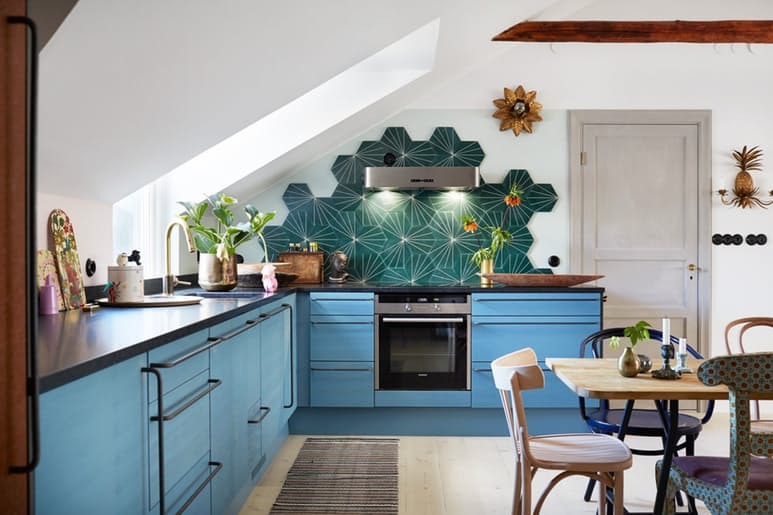 The design factor is a lot tougher already when you have to fit a functioning kitchen into a small space, but small changes can make it even better than a large kitchen. When designing a small kitchen think of: size, color, light and function. So focus first on function, making sure you have the appliances and work areas you need. You may be able to save a bit of space by using scaled-down or innovative appliances, including refrigerator and freezer drawers and pint-sized microwaves, stoves (some with just two burners) and single sinks. The function is there, without all the square footage! If workspace is at a premium, consider a small-scale island or a counter-topped cart that can be rolled away into a closet when not in use. Now just because you need to really hone in on function of your small kitchen does not mean you have to lose any space to style. The color of walls, appliances, and counter tops, bar stools, and backsplash can change the mood of your pint sized kitchen. Going with more pale colors can help with light, but don’t be afraid to go bold and add color and mix your patterns. Using the same color and style of fixtures and cabinet knobs can unify a design when you are using different textures and patterns in your small kitchen. Tiny kitchens can feel claustrophobic if there are upper cabinets towering over you in such a small space. Most of the time cooks can’t even reach those upper cabinets anyways, and in a small kitchen there isn’t much room for a stool or ladder. Skip the excessive cabinets and opt for a more spacious approach with open shelves. You can also use magnetic knife strips, pot racks and give your kitchen a designer way to show off your favorite dish sets and even artwork. And like any other room, your small kitchen needs great lighting that you can use for cooking and for atmosphere. Fluorescent lighting, which casts a bluish light impacting the colorization of objects in the room, including the food, is frequently found in kitchens. To counteract it, consider hanging pendant lights that bathe your eating area in a more appetizing color. Designer Tip: Try using glass doors from the kitchen into the next room or to the outside, this will increase light in the kitchen and also give the illusion of more space. Don’t let small spaces give you design block. No matter a small galley kitchen or small apartment kitchen – you can make your design amazing if you trim the fat and keep your design neat. Your kitchen backsplash may be just one of the simplest parts or your home. However, you could have so many dilemmas when it comes to the installation and probably with remodeling in the future. When you look at a backsplash area, it seems so simple being a rectangular space on your kitchen wall. When you try to work on it and improve it the way you like, you come to find that it is not that easy to handle the job. Working on any vertical surface can be challenging. You may need to find a contractor for your Los Angeles Kitchen remodel to assist you and take some work off your hands. Why hire a contractor to work on your backsplash project? Here are some common problems about kitchen backsplash that would require help from a professional contractor, and make you thankful that you have some professional help. 1. Timing in placing the backsplash – everything should start with planning, most especially when it comes to the kitchen backsplash. What most people have dilemmas about is when to fix the backsplash. Do you install backsplash before the cabinets go in? Do you do the backsplash last? The say of a professional contractor is needed in this case. The experts will know when to take care of the backsplash, appropriately, to make sure that everything will turn out with the best quality. For example you won’t ruin a new countertop by dropping grout. 2. Right height for backsplash – this is a common problem for most homeowners. They end up doing the backsplash themselves but are not sure about the right height for it. Would it be alright to keep it low or high? Should the height be dependent with the width of the kitchen counter? A contractor will be able to measure the perfect height for it, and make sure that the wall is ready for any height and weight you choose. 3. Tiling process – it could be easy to place the tile on the wall, but which tile should be used for the backsplash purposes? You may need to contact a professional to help you in choosing the right type of tile to use. You can let them do the installation as well for better results. Although you can install the tiles yourself, a professional contractor can do it expertly in a timely manner. Get the best results for your money, after all this is an investment. 4. Backsplash design – how should a backsplash look like? Is it a must for it to match the tiles with the designs on the kitchen floor? What material should you use? What angle should the backsplash be installed? Your contractor can answer all these and more questions about back splashes and remodels.